View Quest Travels July 18 – 28 in a larger map with a legend. Zoom in or out on the map by clicking the small + & – signs. Move it around by clicking your mouse button and dragging the map in the desired direction. Click the falcon icons for more information about each location. A lack of good signals from Quest’s transmitter have stretched out our latest round of locations, but it seems that there’s no need to worry. As we have seen for the past several weeks she’s staying put in the Wesleyville-Port Hope area. There are no real surprises in the data, though an odd coincidence placed two consecutive daily readings in exactly the same spot on the 25th and 26th. Quest got back to moving around soon enough though, so she seems to be doing fine. 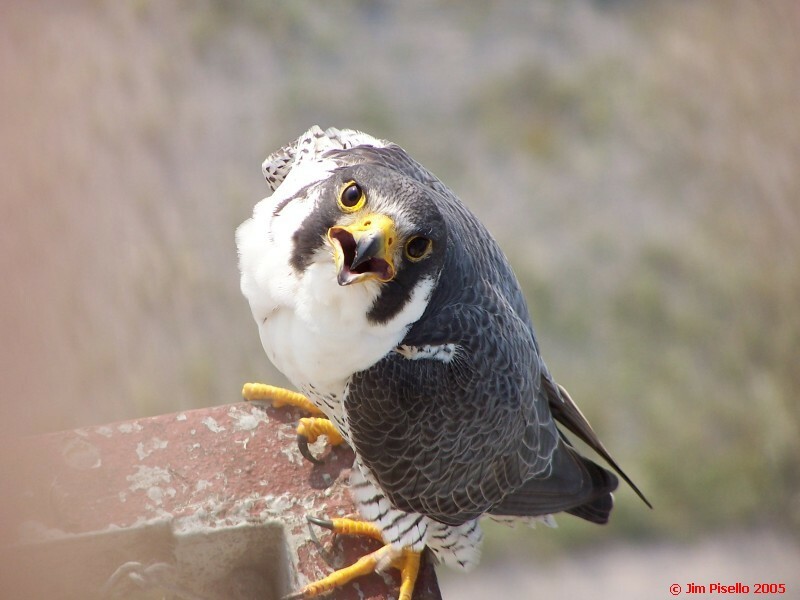 We sent a note off to our friends at the Canadian Peregrine Foundation to see if the old hack box at the Wesleyville power station is still in place. We haven’t received a reply yet, but they’re busy folks up there and I’m sure we’ll hear back as soon as Mark Nash has a few minutes to catch up on his email! Until then Quest is staying in her groove so we’re content that all appears to be well. Something new is coming to the Rochester Falconcam! We’ve been working on it for a while now, and this Saturday, August 1st we’ll unveil a feature that we think you’re all going to enjoy. And while you’re waiting for the big event, keep up with Quest by checking out the map of her latest locations. On an unrelated note… being sharp-eyed falcon fans, you’ve probably noticed that the Falconcam’s high-resolution Main camera has been “stuck” for over a week. We’ve been working on the problem but to date we haven’t had much success. We have a couple more things to try, but it’s possible the fault lies in a problem with the power connection. If we can’t fix it from inside the Times Square building we may have to go the rest of the year without the Main Camera. Even though Archer and Beauty seem pretty comfortable here, they’re a new pair in town. We don’t want to risk stressing them by going out to the nest box until they (presumably) leave later this year. We’ll still have the four others though, so we’ll be able to keep an eye on any activity in the box. 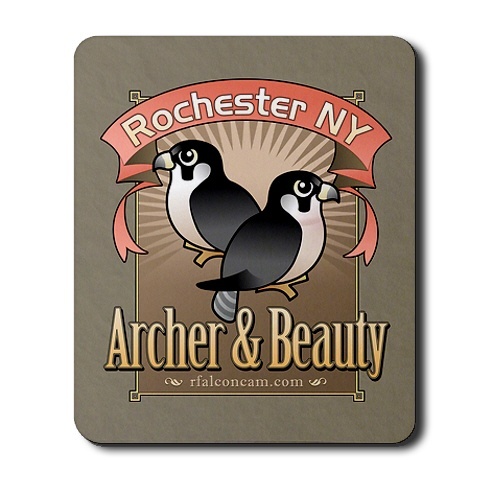 Our friends at Birdorable have released a unique design to honor Rochester’s newest Peregrine pair, Archer and Beauty! Their stylized bird prints are a big hit, and we really like the vintage look that Birdorable came up with for Archer and Beauty. Beauty’s image even features her hallmark darker salmon breast coloring. The design is available on a variety of merchandise including clothes, hats and items for home and office. Birdorable designs make great gifts, and they’re perfect for everyday use too. 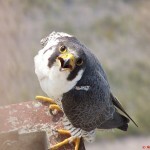 We’re grateful to Amy and Arthur at Birdorable for their continuing partnership with the Rochester Falconcam. Best of all, a portion of the proceeds from sales of all their Falconcam-themed merchandise supports our program. Order your Archer and Beauty Birdorable items today. It’s a great way to welcome these new falcons to Rochester! View Quest Travels July 7 – July 16 in a larger map with a legend. Zoom in or out on the map by clicking the small + & – signs. Move it around by clicking your mouse button and dragging the map in the desired direction. Click the falcon icons for more information about each location. Quest continues her stay on the north shore of Lake Ontario. Her movements indicate a growing familiarity with the area, and unless something changes, it seems like she’ll be staying put for the summer. You keep up with her daily movements at our Quest’s Week map page! View Quest Travels June 27 – July 6 in a larger map with a legend. Zoom in or out on the map by clicking the small + & – signs. Move it around by clicking your mouse button and dragging the map in the desired direction. Click the falcon icons for more information about each location. Quest seems happy to stay on the coast near Port Hope, due north across Lake Ontario from Lyndonville, New York (Rochester area birders will recognize Lyndonville as the place where a Northern Hawk Owl made an appearance a few years ago). She continues to roam along a 10 mile (16km) stretch of southern Ontario province from Port Granby to Port Hope, with much of her activity centered on an unused power plant in Wesleyville. A smokestack there provides an unequaled view of the surroundings and doubtless makes an excellent hunting perch for her. On July 6 she visited a residential street in Port Hope, but for the most part she continues to enjoy life on the north shore of Lake Ontario. We’d love to hear any reports from local birders about how Quest is doing, so if anyone from the Wesleyville & Port Hope areas is reading this, let us know! Here in the US we’re celebrating the birth of our nation plus 233 years with picnics, parades and fireworks displays. On this day of freedom we thought we’d take a look back at one of our favorite falcons. 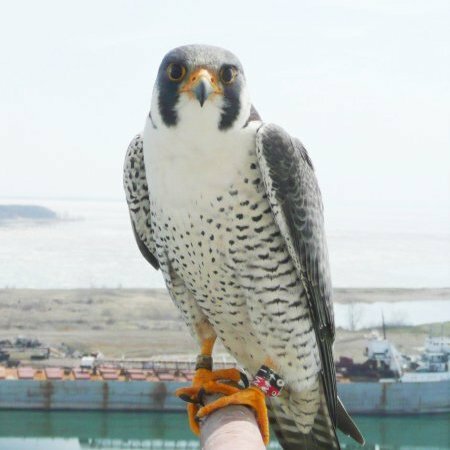 Freedom was the first tiercel hatched from the pairing of Mariah and Kaver back in 2002. In 2005 members of the Kodak Birdcam team visited him at his new home at the Archer Daniels Midland plant in Colborne, Ontario Canada. The following year Freedom had a tiercel of his own, Archer. This year Archer made his way to Rochester, where he’s taken his place as our new resident male. So in a way, things have come full circle. So Mariah gave us Freedom, and Freedom gave us Archer. Now you can have a little bit of Freedom at your fingertips! 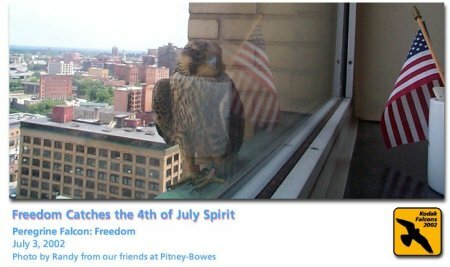 Rochester Falconcam team member Jim Pisello put together this ringtone featuring Freedom’s territorial call. Just save the file on your computer then add it to your phone (if you don’t know how to do that contact your cellular/mobile service provider for assistance). We’d like to leave you with one of our favorite pictures of Freedom. 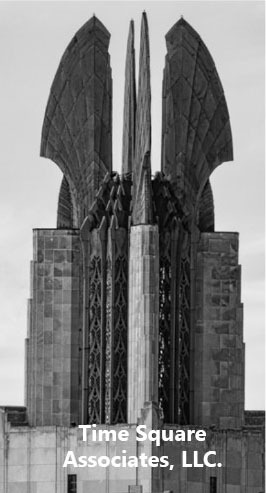 Back when he was a fledgling one of his fans at Kodak snapped a picture of him on the tower. We think it captures the spirit of Independence Day perfectly. You are currently browsing the Imprints blog archives for July, 2009.